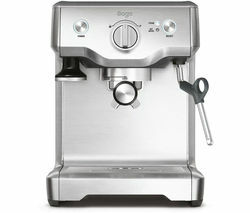 For the professional barista experience at home, Sage coffee machines produce the perfect cup every time. Used by master chef Heston Blumenthal, the Barista Express range offers you complete control, with lots of innovative functions to make lattes, espressos and flat whites easy. 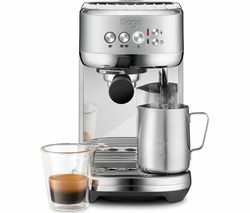 With the Sage coffee machine range, you can create great tasting espresso in less than a minute, from bean to cup. Allowing you to grind your coffee beans right before extraction, its interchangeable filters and a choice of automatic or manual operation ensure authentic results in next to no time. The machine's patented Razor dose trimming tool trims each puck to the right level using its patented twist blade. Clever Dose-Control grinding lets you customise your coffee strength to suit your taste. Using an integrated conical burr grinder to cover as much surface area of your beans as possible, you receive a fuller flavour. Having adjustable grind and dose size means you can deliver just the right amount on demand, cutting out wastage. Delicious coffee demands the perfect temperature. Sage coffee machines use digital temperature control to deliver water at precisely the right temperature. This ensures optimal espresso extraction, avoiding scalding the coffee grounds, and assures even temperatures so that every cup tastes the same. The commercial-style steam wand rotates by 360°, allowing you to hand-texture the micro-foam necessary to enhance the flavour of the coffee and create latte art. And the Sage range’s dedicated hot water outlet makes it a versatile addition to the kitchen, enabling you to preheat cups, make long black coffees and dispense hot water for your favourite teas at the touch of a button. For delicious coffee every day, take a look at the full Sage coffee range, as well as our affordable filter coffee machines and Dolce Gusto coffee machines.